The American cowgirl rides and ropes, understands land and stock and confronts the elements. Celebrate cowgirls both historic and modern with the Spring Roundup at Paws Up – Montana’s premier luxury ranch. 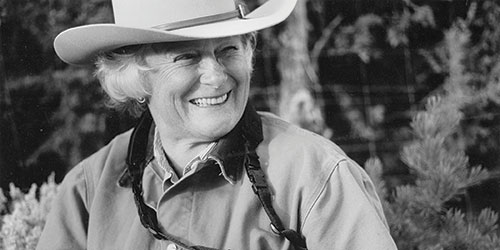 Experience educational workshops, trail rides, sporting clays shooting, photography, campfires, music and mingling unlike ever before with the Cowgirl Hall of Fame Honorees. This event is happening April 24-27 and is limited to the first 40 women, ages 18 and older, who register. Frontier cowgirls broke convention and made countless contributions to western culture by ranching, trail-driving and rodeoing. Modern cowgirls are able to show who’s boss while they master outdoor activities like riding and shooting. Come on over to Montana on invitation from the National Cowgirl Museum and Hall of Fame for the ultimate immersion into cowgirl culture. We’re bringing together experts in the American West in order for you to bring home some sharpened skills along with wonderful Montana memories. 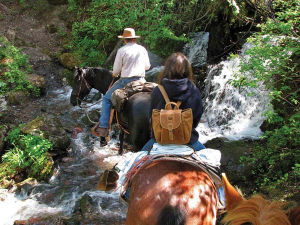 This is a unique opportunity to go deeper than the diaries, memoirs, letters and journals, by learning first-hand from leading figures of the American West on a wide range of cowgirl activities. Herd cattle across the land Lewis & Clark swooned over, test your aim at our sporting clays course, or opt for a myriad of other exhilarating wilderness escapades. The Resort at Paws Up believes in the adventure of free-spirited women everywhere, which is why we’ve teamed up with the National Cowgirl Museum and Hall of Fame for this phenomenal Roundup. Arrive at the center of a welcome reception and mounted shooting demonstration at The Saddle Club. Afterwards be treated to a mighty tasty Cowgirl Baroness Dinner and roast s’mores around a cozy campfire – all alongside Cowgirl Hall of Fame Honorees. Over the weekend ride with the most renown riders of the day and practice photography with a famed American west photographer. By night mingle under the stars and swap stories with American legends. Taste our chef’s refined rustic ranch cuisine of articulately blended culinary dishes made with the freshest meats, produce and ingredients available. Relax in a charming vacation home at the crossroads of incomparable luxury and unspoiled wilderness. Choose from an exciting line-up of events. And, most importantly, enjoy yourself! As a guest staying in The Resort at Paws Up you’ll have the best amenities available to relax and rest up. We provide immaculate creature comforts so that you’ll be ready for all the events planned during the three-day Cowgirl Roundup weekend! For more information, or to make a reservation, please call 877-588-6783. Take a hiatus from the typical hiatus to get some serious adventure in this year! The Resort at Paws Up is offering an exciting spring break challenge in the now-to-be Annual Wilderness Games. The winter Olympics in Sochi have closed, so it’s time to get ready for summer in Rio 2016 by winning gold at Paws Up! Do you have a Katniss Everdeen or Robin Hood in the family who can split an arrow down the center? Does your household boast expert Nintendo Wii hand-eye-coordination? Any resident golfing proteges who could rival Happy Gilmore while fishing like Jeremy Wade? Wanna try? The Wilderness Games are taking place during scheduled weekends in both March and April. We’ll tally up the scores each weekend and award prizes to the families with the highest points. Then, at the conclusion of the games, the family with the highest cumulative score will win the grand prize of a return stay at Paws Up with airfare included! 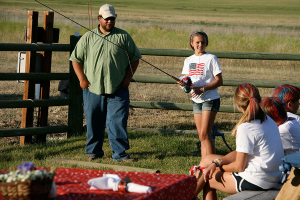 Among the games: archery, horseback egg and spoon race, sporting clays, and fly-casting golf. 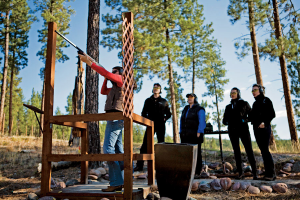 Join an experienced shotgun instructor for a fun and competitive adventure at our Sporting Clays course. After some practice, show off your dead-eye aim in a scored round. 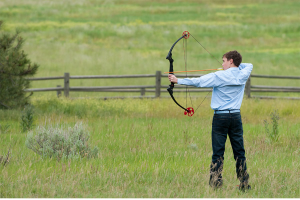 Channel your inner Katniss Everdeen at our professional archery course. Expert instruction by our guides will ensure that you’re on target for this unique and exciting competition. Put your equestrian skills to the test in the Saddle Club arena by completing a timed lap that weaves around barrels all while keeping an egg steadily secured in a spoon the entire way. All of this while relaxing in your very own home away from home. When staying at The Resort at Paws Up the best amenities are on hand during your visit. 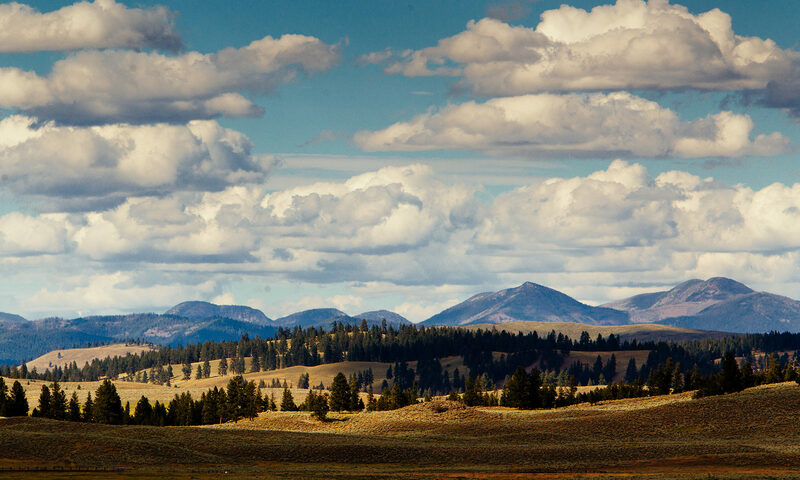 Luxury vacation homes mean an ideal intersection of privacy and peace with the best Montana scenery. Towering oaks are your nearest neighbors along with the Blackfoot River and tranquil creeks. Fine dining can be found in The Village and transportation around The Ranch is easy and complimentary. The whole family will enjoy showing off the best of their skills (with expert instructors on hand for fine tuning) during the Wilderness Games. This is the breakout season for these annual games and your family name could make Paws Up history and, more importantly, legends within your own family history! Trick your kids into being active outdoors through some friendly competition. It’s their perfect adventure with your preferred creature comforts. Action packed days with rejuvenating nights. You’ve been the tourist, the sunbather, the GPS. Cruises are compact, beaches are crowded, and we all know the locals in tourist cities already have their hands full. The Big Sky offers a rejuvenating getaway without the worry of kids wandering into crowds or becoming bored while cooped up in the hotel. Consider spending your well-deserved vacation in the Montana wilderness – with the possibility of winning a complimentary return visit including airfare (restriction apply). It’s a spring break experience that your kids will be talking about for years. 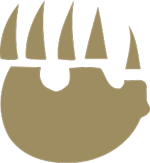 Paws Up also boasts numerous off-the-scoreboard activities to pair alongside the Wilderness Games. ATV tours, horseback riding, river rafting, along with so much more! Enjoy spa treatments pre-game to sharpen the senses and steady the hand. Yoga is available in the Spa Town fitness tent at The Village at Paws Up as well! The April 2 – 5 games weekend has already sold out, so be sure to make your reservation ASAP! Call or chat online today with a Paws Up representative and ask about March 26 – 29 or April 9-12 for “Wilderness Games” specials.